Four community meetings are set for Sunday around the region to focus on what’s being done to stem out-of-school suspensions and to more clearly define the role of school-resource officers. The “No More Sitting Out: Reclaiming Our Democracy” meetings hosted by Metropolitan Congregations United are expected to include school and police officials. They also will focus on generating support for a ballot measure in next month’s election that would increase the minimum wage and an ethics-reform package known as Clean Missouri that would, among other things, tighten campaign contribution limits and ban lobbyist gifts. 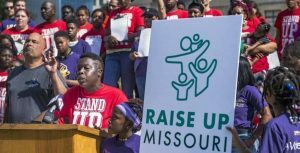 Read more about these critical issues, and how your vote on November 6 could improve the future of St. Louis education and Missouri governance.